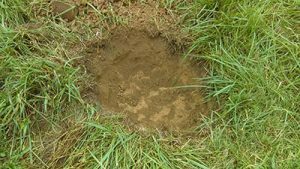 Tammy Horn Potter, Kentucky State Apiarist, offers the following information and advice regarding American and European foulbrood to veterinarians and beekeepers. The worst disease in the honey bee colony is American foulbrood. 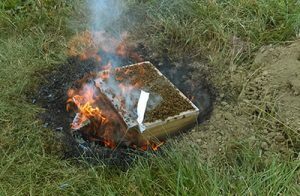 I strongly advise any veterinarian who sees the symptoms described in the following AFB websites (American Foulbrood – Prevention and Management and Symptoms of American Foulbrood) to tell the beekeeper to burn the colony as soon as possible. There is no cure for American foulbrood. 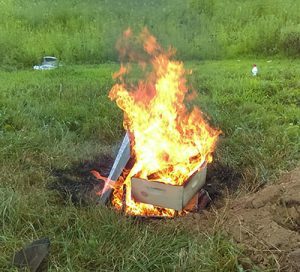 See below for details on how to burn a hive. I do not foresee major disease outbreaks until August. By that time, Terramycin stockpiles will have run out and varroa mites within the beehives will reach their highest levels for the year. If beekeepers haven’t treated (and many new or hobbyist beekeepers do not treat), then the colonies may crash. Strong colonies will rob the weak ones, possibly triggering American foulbrood if the spores are present. In most cases of European foulbrood, requeening the hive will work just fine. Moving colonies to where there is a good honey flow or feeding heavily can also help. 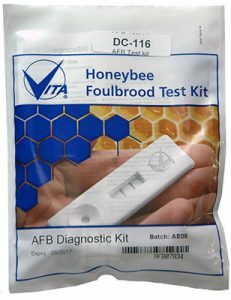 Only if a beekeeper has a lot of hives and an especially bad case of European foulbrood would I recommend the beekeeper get a VFD for tetracycline. Why: The honey bee stomach is filled with beneficial bacteria. If a beekeeper uses an antibiotic, he or she may inadvertently kill a lot of beneficial bacteria that helps honey bees ward off diseases. There is also a lot of antibiotic resistance in U.S. honey bees. Beekeepers need to adjust the yard management styles to have a nuc or several nucs that are to be used in case of hive disease such as European foulbrood, chalkbrood, sacbrood, queenlessness or starvation. There are no other diseases for veterinarians to be aware of as far as VFD is concerned. Additional resources about American Foulbrood can be found on the Kentucky State Beekeepers Association website under Educational Resources for Beekeepers. Check with the fire department to make sure there are no burn bans in effect. Dig a hole large enough to hold equipment. Make sure you have a fire extinguisher handy. Wait until evening when all the bees have returned. Kill the bees by dumping a 5-gallon pail of soapy water into colony from top (use 1 cup of dish soap). When burning, put frames in the fire first, then add boxes, the lid and the bottom board. Cover the pit when finished.